Wander into one of Istanbul’s numerous districts of small commerce and find yourself on a small street with a shoe cobbler, a knife sharpener, and hardware shops. Enter one of those shops, preferably one where two old men are sitting at the counter looking at the horse racing form or working the crossword puzzle. Follow their instructions to the nearest esnaf lokantasi*. 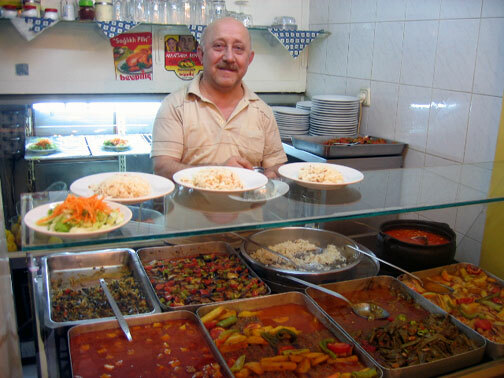 We usually steer clear of the touristy old city district of Kumkapı, where you are more likely to be accosted by an aggressive maitre d’ trying to corral you into his overpriced fish restaurant than to find something simple, tasty and reasonably priced to eat. Sadly, in order to beat the competition next door, most of Kumkapı’s famed fish restaurants seem to have invested more in aggressive customer corralling tactics than in kitchen talent. However, tucked into the neighborhood’s backstreets, we’ve found a few hidden dining gems that locals in the know frequent. The Black Sea area is Turkey’s culinary misfit – not really about kebabs or meze. If anything, the food there seems to have been mysteriously transplanted from the American Deep South. We’re talking corn bread, collard greens and smoky bean stews. It’s simple, filling, down-home food and Hayvore is a great – and affordable – spot to get acquainted with it. Actually, it serves some of the best Black Sea food that we have had in Istanbul. Everything ok but all 5 workingman restaurants are around Beyoglu. You can find better ones, in Gunesli, Yenibosna, Seyrantepe, Maltepe. How about some names and addresses? We would love to check some out.